While cleaning out my closet a few weeks ago, I came across a pair of old-school black Converse tennis shoes—shoes I’d sworn off several years ago. I thought I’d outgrown sneakers. They just didn’t match the sophisticated, successful adult persona that I was going for. Instead of sneakers, I pictured myself in heels and a business-casual wardrobe, walking into my first job out of college. That entry-level position would eventually lead me to my dream editor job, where I could be financially independent, pay my own bills, love my career, and eventually move into my own place. Yet, despite having celebrated several birthdays, bringing in a few new years, and achieving several milestones (graduating, getting published on my favorite sites, coming really close to having my dream wardrobe), that grown-up, sophisticated Shae has yet to show up. And I think it’ll be awhile before she does. It’s been a year since I’ve graduated college and my first job out of college required me to ask “how may I help you” while wearing ugly non-slip shoes and seating people to a table. Lately, the only jobs I’ve come close to getting are positions that pay minimum wage or slightly above it, and nothing I’d be proud enough to put on a business card. Though my career is taking seemingly forever to start up, I sometimes would catch glimpses of my sophisticated adult self when I put on my suit and heels for an interview or when I head out with friends to a comedy club on a Saturday night. But I would quickly realize that she was an imposter when the interview suit is a smidge too big,when the comedians on stage always make fun of my friends and me for being the “youngins” of the crowd, and when I have to call my mother to help cover the cost of my car repairs. Sitting in all my boredom, the byproduct of unemployment, I began reading my high school and freshman year college journals. Instantly, I was taken back to an unsophisticated, yet happier version of myself. I missed the 4+ years younger version of me, who always wore blue, white, or black Converses and dreamed of being an inspirational writer. 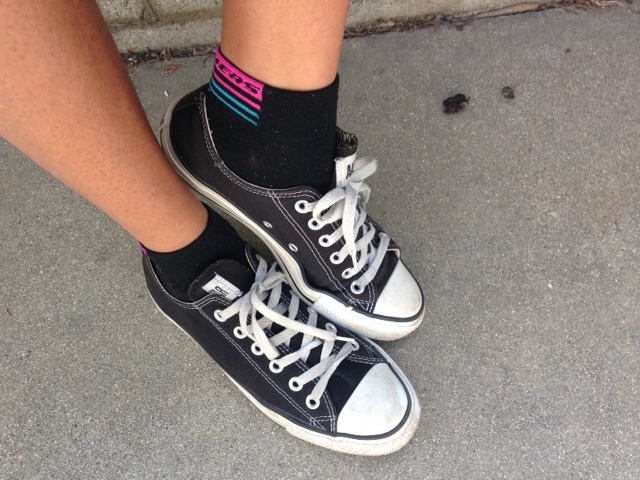 This girl, in her plain sneakers, wrote hundreds of pages for novels she wanted to publish. This girl believed that someday she would do great things. Her journals weren’t littered with complains like mine currently are.Instead, they were filled with ideas and possibilities (and of course talk of boys, prom, and friends). The younger me had more faith in herself than the pretend-adult me. So I’m taking back the idealist attitude along with my Chuck’s sneakers. I’ve decided to put down my glamorized idea of what adulthood looks like, and repossess that uplifting spirit I had before I became so worried about finding a job, paying off college loans, and becoming the woman that wears fancy heels. I still have faith that I’ll make it to that career path one day (hopefully sooner than later)—and I might have to be underemployed for a little while until I get there. But instead of moping around and hating my life, I’ll do it with an open mind, faith in my future success, and my black Converses. ← Where Are All the Leading Ladies of Color?